Get Some Free Stickers By Mail! Stickers are one of our very favorite FREE product offers, because there’s always an offer going on somewhere. We search high and low for the best offers on stickers commemorating holidays, history, cartoons, llamas, and so much more – the variety is endless! Whether you want them as gifts or just for fun, check here often to see the latest free sticker offerings! Attention skaters! Check out Almost Skateboard’s website for Free Stickers! Use the sticker request form on the right side of their page to request some stickers today! 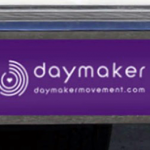 Join the Day Maker Movement by sporting a cool FREE Daymaker Bumper Sticker! Hurry and get your free sticker while supplies last. Here’s how to get your FREE Seek Dry Goods Sticker. Podcast fans, listen up! Here’s your chance to get some really cool stickers!! FREE Chilo Stickers! Simply click Add To Cart and then proceed to checkout – you won’t be charged – and then they’ll ship the sticker right to you! If you’re into drones and cool tech, don’t miss your chance to grab a FREE Drone Parks Sticker!! To get your sticker, simply scroll down and fill out the form with your name, email, and address, then hit the Submit button. They’ll ship the sticker right to your door! Here’s your chance to grab FREE Vestigo Stickers!! If you want to get awesome stickers for your car, your computer, or wherever you’d like, you only need to click Get Stickers and fill out the form with your name and address information. That’s it! They’ll ship awesome stickers right to your door. Here’s a fun offer that lets you get 2 FREE Valvoline Stickers!! If you’re interested in these fun stickers, you’ll first need to sign up – earning you 550 points – which is enough to get 2 FREE Valvoline Stickers. It’s completely free to sign up, so don’t hesitate! Show your political support by grabbing this totally FREE Trump Supporter Sticker! If you’re interested in showing everyone that you support Trump, you only need to fill out your name and address information, then click the big red Send Me My Sticker button. That’s it! They’ll mail it right to you. Here’s a sweet deal: you can get a FREE Original Stix Sticker! If you’re interested in this cool sticker, you’ll only need to fill out the super brief form with your name and address information, then click Submit. Then allow about 2-3 weeks for delivery right to your home.